Norman Lamb called our campaign ‘mental health extremists‘ for simply pointing out that Norman Lamb claims to be a mental health champion whilst cutting mental health funding and services. Now the £600 million’s worth of Norman Lamb’s duplicity is clear for all to see. 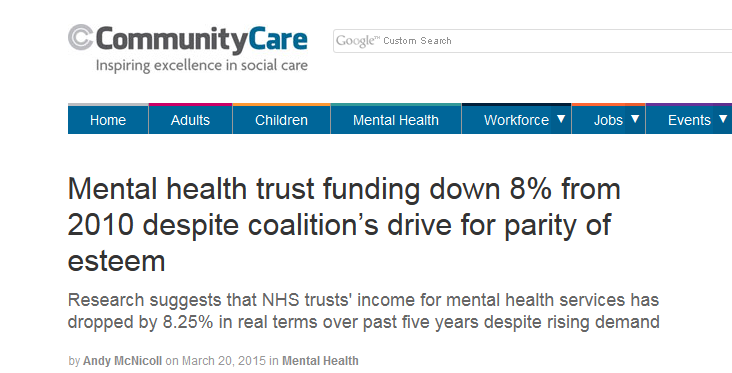 What kind of ‘drive for parity of esteem’ results in the funding of mental health trusts falling 8 per cent? 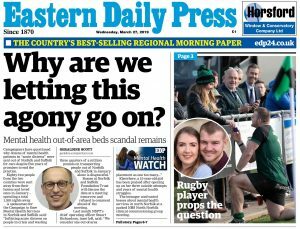 The situation is even worse here in Norfolk and Suffolk at Norman Lamb’s local mental health trust, Norfolk & Suffolk NHS Foundation Trust (NSFT), where funding has fallen by 18 per cent relative to physical health whilst demand has risen substantially. NSFT’s Five Year Strategic Plan accepted by the NHS Regulator, Monitor, envisages another £44 million of cuts to come. 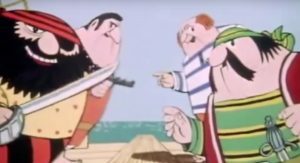 Spending on Assertive Outreach fell by 56 per cent nationally but here in Norfolk and Suffolk it fell by 100 per cent as NSFT completely axed its Assertive Outreach teams without any replacement or plan with disastrous, sometimes fatal, consequences. Shameful. Norman Lamb tries to blame the Kafkaesque clinical commissioning groups (CCGs) and NHS England but claims he doesn’t regret voting for the Health & Social Care Bill which created them. 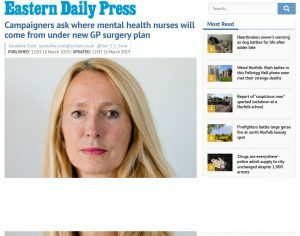 Figures obtained from 43 of England’s 56 NHS mental health trusts through Freedom of Information requests, an analysis of financial reports and other research, show that total funding for the trusts’ mental health services dropped in cash terms from £6.7bn in 2010-11 to an expected £6.6bn in 2014-15. The figures amount to a real terms reduction of 8.25%, or almost £600m, once inflation has been accounted for. At the same time referrals to community mental health teams, the services designed to stop people’s mental health deteriorating to crisis point, have risen by nearly 20%. The funding pressure on NHS mental health trusts has contributed to the closure of more than 2,100 beds since 2011. Problems accessing beds or alternatives to admission have been linked to a series of deaths and led to acutely unwell adults and children being sent to out-of-area hospitals for care, often hundreds of miles from their homes. Local authority spending on working-age adults with mental health needs fell by 13.2% in real terms between 2010-11 and 2013-14, the most recent year for which official figures are available. Frontline social workers told us these cuts have seen key preventive social care and low-level housing support being stripped back. Those services, staff say, can play a vital role in building people’s resilience and preventing isolation. Last month Health Service Journal revealed that several commissioners were disregarding national guidance to increase real terms spending on mental health in 2015-16. A senior coroner warned commissioners that a community crisis resolution home treatment team – the service model that is now the most commonly used community alternative to hospital admission – “was not sufficiently funded” following an investigation into a patient suicide. 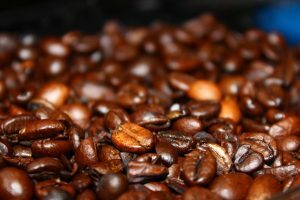 A report drawn up five months after the coroner’s warning showed the team was still short staffed. Some crisis teams have been carrying caseloads double the recommended limits and others have had staffing levels an estimated 70% below what managers believed was needed “to meet national expectations”. Out-of-hours responses are a particular issue. Some community crisis services do not offer home visits after 9pm. Patients face long waits to be assigned a care coordinator due to a lack of capacity in some community mental health teams. Research findings from a major study suggest most crisis teams are falling short of several DH guidelines drawn up for the services. An inspection of services run by Norfolk and Suffolk NHS Foundation Trust published in February found that, on the day of inspection, one of the trust’s crisis teams only had “two health care assistants and a student” on duty from 8 till 11am due to staff sickness. The service’s “rotas showed that understaffing was frequent”. And no doubt more cuts to come post election……. ..And with other community services such as District Nurses down in East Anglia by 24% since 2010, the so called emphasis on ‘community care’, as a ‘reason’ to close acute beds, must now be shown to be a complete sham.